Granville Hunt's lost films include plenty of shots of life at home and his newborn daughter in the 1940s. We speak to the little girl in the movies, who is now a retired physics and astronomy professor who worked with NASA. Note: This article is part 4 of the 10News series (link) Hunt for History: The lost films of Granville Hunt. 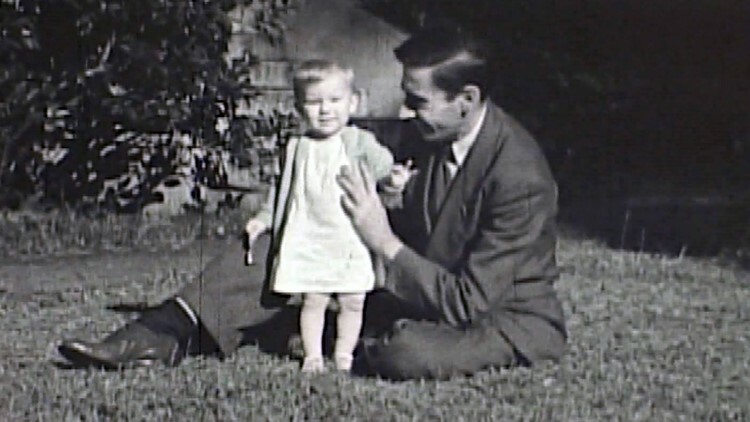 (WBIR) Reels of Granville Hunt's rediscovered home movies show the life of his daughter, Karen Robinson Hunt, from a newborn in 1945 through her first birthday party in 1946. We located Karen Robinson Hunt Hackney in Bowling Green, Kentucky. 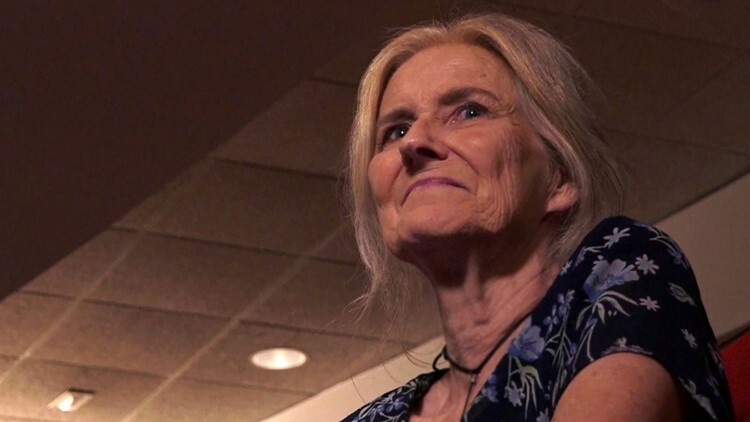 The energetic infant in the films is now a retired professor of physics and astronomy professor at Western Kentucky University, where she headed the NASA Consortium for the state of Kentucky. "My father was Granville Hunt and my mother was Mildred Robinson Hunt. Her friends called her Mickey or Mick. You see these films show the Robinson family farm and cabin near Loudon. On that farm, my father would show me the constellations and say he was sure everyone had a star up there," said Hackney. Granville Hunt lifts his infant daughter, Karen, above his head in 1945. The lost films show Granville, Mickey Hunt, and her parents designing and building a log cabin near Robinson's Mill in 1940. When Granville's father-in-law, Carl Robinson, retired from a long career as a railroad machinist in 1946, he and his wife spent their summers at the cabin on the farm. "I spent my summers at the farm, too. You see in those films, farming in those days was difficult. We had to plow some areas with mules. My father would drive up from Chattanooga every weekend from his job at TVA. Some of my proudest memories were when he flew over the farm to photograph the TVA transmission lines, they would circle, and we would wave at him hanging out of that airplane with his camera," smiled Hackney. Hackney said her father was adventurous and took her mother along for the ride. Granville proposed marriage after taking Mickey up in an airplane in 1934. 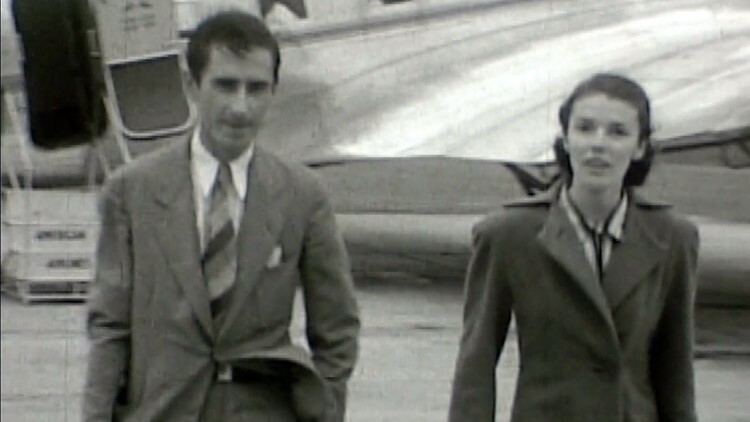 Granville and Mickey Hunt at McGhee Tyson Airport in 1939. "There was no way she could say no at that point," laughed Hackney. "He liked airplanes and flying." Granville Hunt had access to airplanes as a photographer for TVA. Hunt had a knack for working with aerial photography that developed into a new role during World War 2. TVA transferred Hunt to Chattanooga for "exciting, top-secret work" making aerial maps for the military of enemy territories and troop movements. "TVA made tremendous amount of contributions during World War 2. One a lot of people are not aware of is we had the maps and surveys unit in Chattanooga," said TVA historian Pat Ezzell. "The work they did there was so secretive, the only photos we have of the operation were taken after the war. They re-created some of the work for photos after the war, but never allowed cameras when it was actually taking place." Hunt toured several government photo facilities and wrote the guidelines for how TVA developed photography for the large military maps. "Reconnaissance would send all the aerial pictures they took to Chattanooga. They would develop these huge prints that were then converted to maps and sent back to the war in Europe and the Pacific," said Hackney. 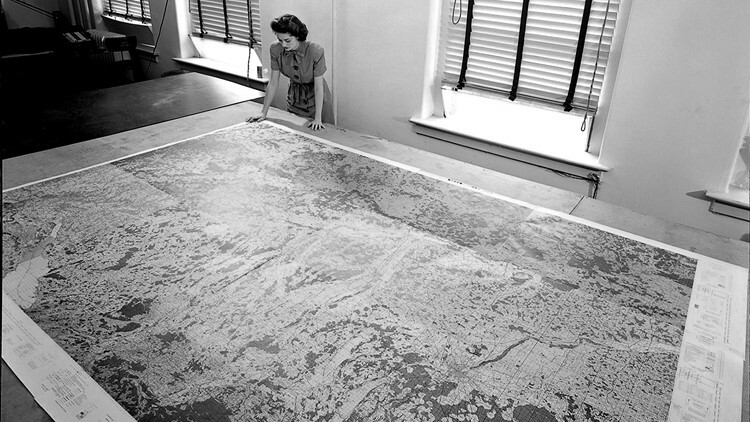 TVA photo of the large reconnaissance maps produced in Chattanooga using aerial photography during World War 2. For an adventurous person like Granville Hunt, there were mixed feelings about serving his country in an office in Chattanooga while his friends went overseas to fight. Hunt was in his 30s and was an expert outdoorsman who blazed the Appalachian Trail. More than once, he tried to leave TVA and enlist for combat. "He would get on the bus and head to Fort Oglethorpe. They never would take him because they said, 'You have to go back and keep doing your job.' The job that he was doing was so vital and there was not time to get anybody in and trained his level," said Hackney. Hunt continued fighting for his country as hard as he could with his role at home. His team at TVA mapped more than 500,000 miles of enemy territory to provide crucial intelligence to the Allied forces. "Think about half a million miles of foreign territory That is tedious work you're doing and it required expertise," said Ezzell. "One of the impressive things about my dad was the work ethic he had. During the war, that important task that TVA had to do, he really worked tirelessly," said Hackney. Granville Hunt helps his daughter, Karen, stand as an infant in 1945. Hunt's lost-and-found films show some of his TVA coworkers in Chattanooga. As usual, he is having fun with the camera and performing trick-photography to entertain his colleagues. "One of the things I remember about my father is everybody liked him. He never met a stranger and people liked him, which was a wonderful quality. He also cared so much about his work. He was someone who really liked cutting-edge technology and learning how things worked," said Hackney. "That is what I love in these films when you see my parents and grandparents designing that cabin and then doing the work. He instilled that in me. As soon as I was old enough to lift something, I was helping him carry photography equipment and take pictures. My parents were always very encouraging and helped me learn science and math. I was one of only three female students in the physics department at the University of Tennessee." Karen says she missed her first physics exam as a freshman at UT to attend her father's funeral. Granville Hunt battled cancer of the esophagus in the in the final months of his life. He died October 18, 1963, at the age of 54. Headstone at Roberson Cemetery in Loudon County for Granville and Mildred Hunt. "My husband and I both went to Fulton High School and then to the University of Tennessee. My father gave Richard [Hackney] the assignment of researching everything he could about the cobalt cancer treatments," said Hackney. "It was a very sad situation because we knew his condition was not something he could live through." Granville Hunt is buried at Roberson Cemetery in Loudon County beside his wife. Mildred Robinson Hunt died in 1993. 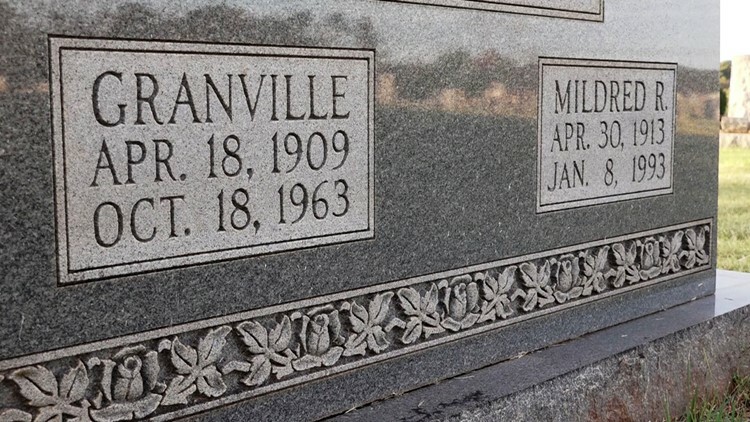 The Hunts are buried next to the graves of Mildred's parents, Carl and Laura Robinson. Karen Robinson Hunt married fellow physics and astronomy student Richard Hackney in 1967. Both graduated from the University of Tennessee, completed their doctorates at the University of Florida, and were hired as professors at Western Kentucky University in the early 1970s. Capturing light on film was Granville Hunt's profession and passion. The little girl who helped her father take pictures grew up to capture light from the depths of the universe. 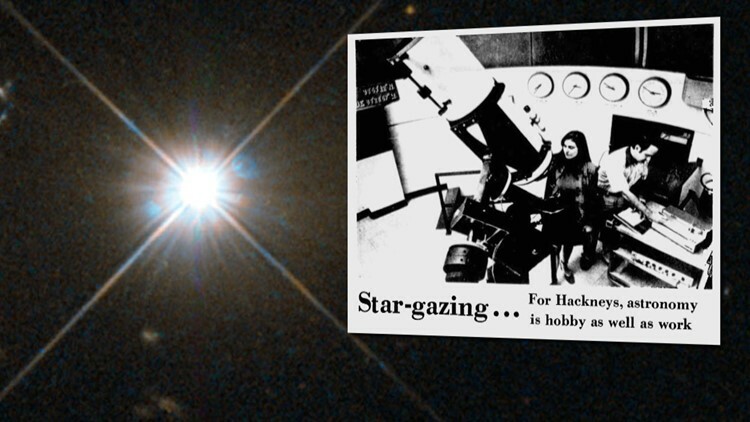 Karen Hunt Hackney and her late-husband, Richard Hackney, taught astronomy and studied quasars as long-time professors at Western Kentucky University. "Our first grant was with the International Ultraviolet Explorer Satellite. It was a learning experience for NASA and the space telescope. We studied active galactic nuclei, quasars, and the light that would not split into a spectrum," said Hackney. A Louisville Courier-Journal newspaper headline in 1978 reads, "Husband-wife team is studying quasar for clues to the origin of the universe." Richard and Karen Hackney were renowned leaders in physics and astronomy and helped universities across the state receive funding for NASA research projects. Richard Hackney died in 2007 and Karen retired in 2009. Hackney says her father's lost films are especially meaningful because she lost many photographs in a house fire in 2011. Her greatest enjoyment from the films is not personal-nostalgia. She keeps her focus on the future. Karen Hunt Hackney is a retired astronomy and physics professor at Western Kentucky University in Bowling Green, Kentucky. "What I have enjoyed is how happy my son, Andy, is to see these films. He obviously never knew his granddad. He and his wife, Odette, live in Australia and I have two beautiful young grandchildren. My son has enjoyed seeing my dad playing with me the same way he does with his children. I'm also looking at this through the eyes of my granddaughter, Olivia, and grandson, Leo, and maybe their children someday. I like to think about the future and that's why I have always loved students, because they are the future," said Hackney.